﻿ Rancho Santa Margarita Real Estate | RSM Home Sales and Rentals Laguna Hills Home For Sale | Coming Soon. Not in MLS! Laguna Hills Home For Sale! 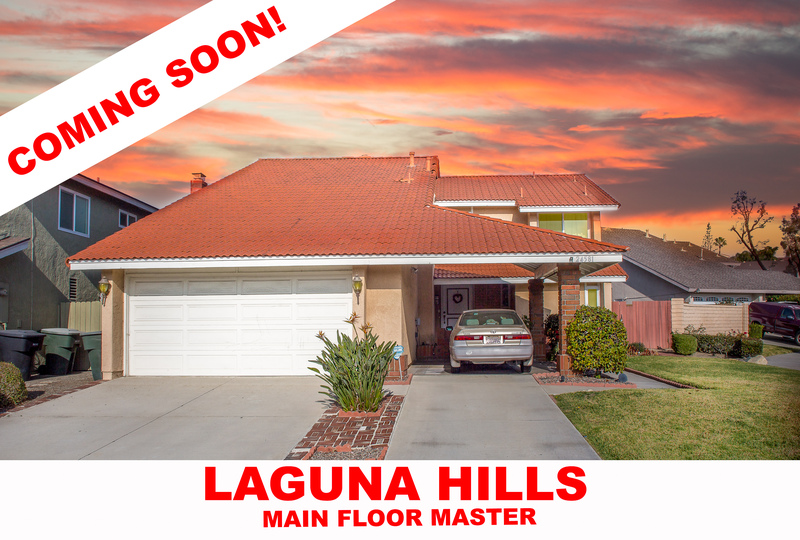 Laguna Hills Home with Main Floor Master, 4 Beds and 3 Baths. Excellent Location! Large 2800 Square foot home features 4 Bedrooms, 3 baths and a large loft that could easily be converted to a fifth bedroom. Quiet street corner lot location offers added privacy and adjacent to a mini culdesac. Lovely french doors open from the living room to the back patio. Large Formal living room and separate family room in this Laguna Hills home. Stainless appliances and granite counters in kitchen with newer wood cabinetry. One Main Floor Master bedroom and Master Bath downstairs. All other bedrooms are upstairs. Perfect for that growing family. Located close to award winning schools, Saddleback hospital and new developments coming soon at former Laguna Hills Mall location. This Laguna Hills home will not last. Seller is performing some final touches and home is not yet listed in MLS! Contact Jesse for more info on this Laguna Hills home for sale!.